innovative cups will help you discover new baking ideas. Please contact us when you can’t find the containers in the shape and design you need. Our five sales offices will immediately undertake to accommodate your request. The persons responsible will be carefully selected from the Sales Department, Planning & Development Department, Engineering Department and Production Department. 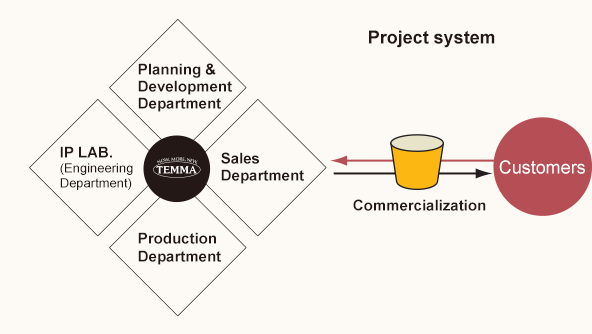 A project system will be set up to address your request. Ideas from customers are immediately converted into shapes. First of all, we listen to your request in detail. We then consider the usage purpose, required functionality, materials, form, size, design and desirable cost. Based on the request, a plan will be proposed on schedule and cost including base material development, machine usage and necessity of producing container molds. Samples will be produced, based on the proposed plan. We will continue to improve the sample until it reaches the customer’s saisfaction. Trial tests will be requested under the same conditions as the products will be actually used. Performance should be checked through each process of manufacturing, packaging, distribution and sales. Final specification will be confirmed including materials, form, size, color proof for design, and cost before starting production. A production plan will be determined that meets a customer’s desirable delivery time and our production capabilities. The products will be delivered to customers in the specified packaging form.